Karen A. 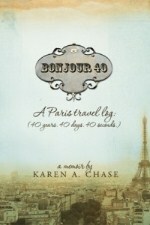 Chase, has won three independent book publishing awards in two competitions for her first book, Bonjour 40: A Paris Travel Log (40 years. 40 days. 40 seconds.). In both competitions, her self-published book competed against small- to mid-sized independent publishers, university and museum presses, and corporations that publish fewer than 50 titles a year. Bonjour 40 won an IPPY Silver Medal for best Travel Essay in the Independent Book Publishers Award, and in the 2013 Next Generation Indie Book Awards it won a Winners Medal for Best Design Non-fiction, and a Finalist Medal for Best Travel/Travel Guide. Entirely self-published, Bonjour 40 was written, designed, and published by Chase and includes 132 full-color pages with over 100 of her own professional photographs. She worked with April Michelle Davis of Editorial Inspirations to professionally edit the manuscript. This entry was posted on Saturday, June 1st, 2013 at 12:00 pm and is filed under EI News. You can follow any responses to this entry through the RSS 2.0 feed. Responses are currently closed, but you can trackback from your own site.